SpareOne has unveiled a new phone this week at CES which is equipped with a massive 15 year battery life. The SpareOne has been designed to provide emergency backup and uses a single AA battery to provide power for a 15 year shelf life. 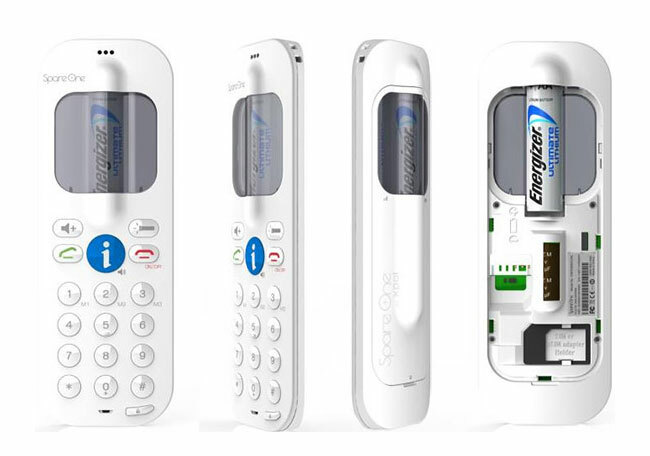 The new SpareOne design looks like any other mobile phone, expect where the LCD should be there is a battery compartment.SpareOne says the phone will work with any AA battery, but an Energizer battery is recommended. But remember the mother company of SpareOne also owns Energizer. But Energizer claim their ultimate lithium battery can be left for 15 years without usage and still provide 10 hours talk time. The SpareOne phone will be sold in three different versions a GSM 850/1900 for parts of America, 3G model for Japan and a GSM 900/1800 model for the rest of the world.